DNA Live and Live Nation have partnered to bring the return of Bud Light Escapade Music Festival for its 10th installment. The two-day festival will be held from Saturday, June 22 to Sunday, June 23, 2019 at TD Place in Ottawa, Canada for its largest edition to date. The program will deliver a new experience, a new design, and additions. The Bud Light Escapade Music Festival began in 2010, with never-before-seen sound and visual production for an event of this kind in the NCR. The event was led by Canadian-born superstar DJ and producer, not to mention the Grammy Award winner, Deadmau5. Since the inaugural Festival, Escapade has grown, with more artists, more spectators and a longer run. The event has been consecrated as a first-rate North American festival by adding unique elements such as the Escapade Club series and by welcoming more than 30,000 participants. Dedicated to the development of the electronic music scene, the event to be held in the nation's capital will be presented on 4 distinct stage, MainStage, Bass Stage, Trance Stage, and Dreambox Stage, which will be devoted to local and emerging artists. 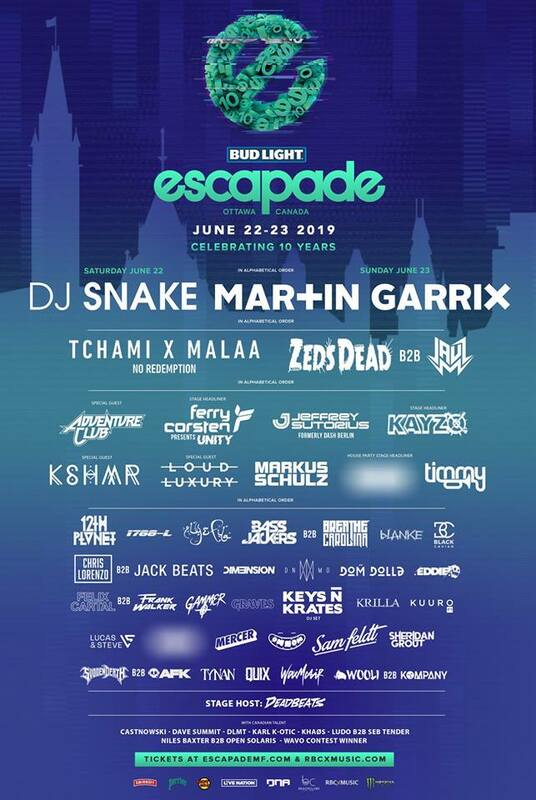 The 10th anniversary line-up will be undoubtedly the most impressive ever to be presented by Escapade. It'll include a wide range of artists, covering musical realms such as electronic, bass, house, trance and trap and artists including Martin Garrix, Markus Schulz, DJ Snake, Tchami, Malaa, Zeds Dead, plus Timmy Trumpet to name a few. An out-of-the-ordinary experience is to be expected. "We want to continue providing an exceptional experience for festival-goers. For this 10th edition, you can expect something you've never seen before. " emphasizes Olivier Primeau, partner and co-owner of the Beachclub. "This year, Escapade will undoubtedly be our largest edition to date, with a line-up of international and local artists." adds Ali Shafaee, Director of Partnerships at DNA Live, producers of the Festival. As festival season inches closer the excited becomes greater, be immerse in one of Canada’s thrilling music events and celebrate 10 years of music, love, friendships, old and new memories. Spend your festival season at Bud Light Escapade Festival.